The UK’s leading specialists in landscape and water engineering has launched a new dedicated website to promote their drainage services. 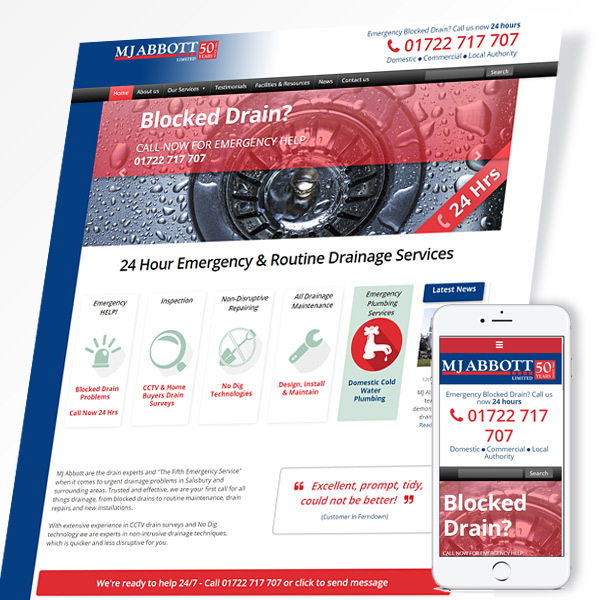 The aim to increase awareness and improved SEO web presence for the company’s 24/7 emergency response burst drains and other drainage disasters division. The new site has expanded the existing single page on the main site (www.mjabbott.co.uk) with more specific information and how to get help. Fivepilchard were pleased to respond and accepted the challenge to help raise their search engine profile with a tuned website furnished with lots of good information about the services. “Now the site is live, I just wanted to say how happy we are with the functionality, look and feel.” Jonathan Abbot, Managing Director.